The battle is really BOOM-ing with Battle Royale’s latest weapon… Remote Explosives! Save the World’s Spring it On! event sees the addition of a new, lucky questline and gains a new Hero who’s as green as a four-leafed clover. One more thing… Fortnite Battle Royale is coming to Mobile! We couldn’t be more excited to bring the game you all love to your hand-held devices. Head to fortnite.com/mobile for more details. Topple fortresses at the click of a button. Find loot in the most unexpected of places. 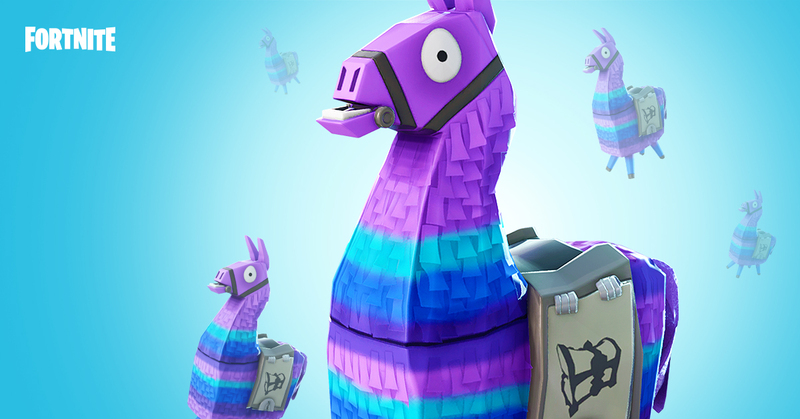 The Supply Llama has joined the battle. Uncover treacherous treasures, track mythical creatures, and brave springtime shenanigans in ‘Luck of the Storm’! Charge your abilities by defeating enemies and be the lucky charm we’ve always needed! Wondering what’s happening with Fortnite? Find real-time info via the Epic Games Status Page here. Improved server performance and reduced bandwidth usage when players are jumping. Korean, Japanese, and Chinese languages will display properly in the UI when changing languages while playing the game. Wanting to track the top community issues? Head over to our snazzy new Fortnite | Community Issues Trello board here. Fortnite Battle Royale announced for Mobile! Click here to sign-up for the Invite Event on iOS. Extremely rare - only 3 created per match. Location is chosen at random. 10 stacks of each ammo type. Detonated by using the "Aim Down Sights" button. Found in Supply Llamas, Treasure Chests, Floor Loot or Supply Drops. Stacks of 4 (Max of 10). Smoke Grenade has been vaulted. Updated the ‘No Scope Hunting Rifle’ name to simply be ‘Hunting Rifle’. Fixed missing environmental impact FX on Hunting Rifle projectiles. *NOTE: This mode will be enabled on 3/19. Blitz has much shorter storm times resulting in faster & more intense matches! Maximum match length is 15 minutes. Fixed an issue causing the unintentional rotation of stairs. Fixed an issue causing an eliminated player’s collision to stick around temporarily, making it difficult to pick-up their dropped items. Fixed the News window not displaying once you select Battle Royale. Fixed a bug that sometimes made characters appear with the wrong orientation when previewing items in the front end menu. Updated the circular bullet impact FX so that they help indicate the direction the shot came from. Fixed gunshot sound stuttering that would occur when firing an automatic weapon at low ammo counts. Fixed issue that caused gunfire and other sounds to play at louder volume than usual. Optimized shield effects on players to improve overall frame rate. This patch includes a reversion of the Critical Chance re-balance done in the v3.2 update, and a pass to fix bugs and balance problems with the stat caps. Next chapter of Spring it On! unlocks - ‘Luck of the Storm’. Party shared F.O.R.T. stat caps have been reverted to their old balance relative to the personal F.O.R.T. stat caps. One high-level friend can share enough F.O.R.T. stats to boost your duo to the 4-player balance point, if they are far enough above your level. F.O.R.T. stat caps in Stonewood have been reverted to the end-of-zone threshold. F.O.R.T. stat caps have increased across the other three locations. They begin being offset upwards in mid-Plankerton, and this offset increases at higher difficulties. In the top 2 difficulties of Plankerton. In the top 3 difficulties of Canny Valley. In the top 4 difficulties of Twine Peaks. Weapon level caps have been increased to match character level caps. Increased starting cap from 12 to 20. Caps increase in increments of 10 until they reach 50. The points where Weapon and Character level caps increase has been moved a few difficulties earlier. Set base Weapon Skill to 50 for all heroes. This allows low-level players to effectively use high-level guns while playing in high-level areas. As a result of this change the Weapon Skill skill tree nodes no longer function. We will replace or remove these nodes in a future patch. Stat caps for Storm Shield Defenses were lower than intended and have been raised to their intended levels (equivalent to end-of-zone missions). Critical Chance weapon and trap perks increased from 11.5% / 16.5% / 21% to 14% / 21% / 28%. This reverts the change made to Critical Chance in the v3.2 patch. 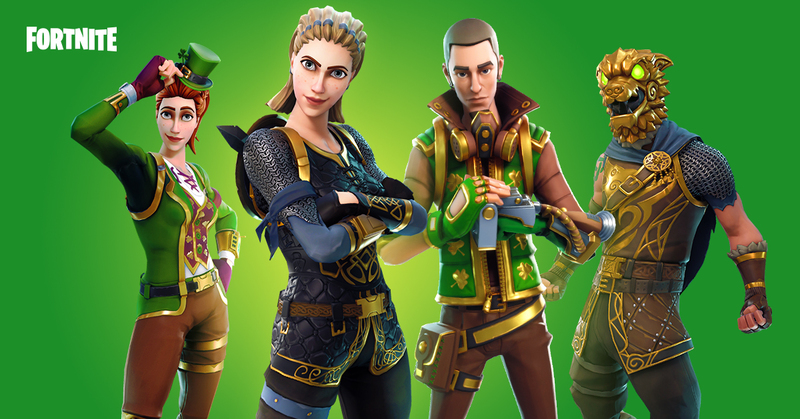 Shamrock Reclaimer Outlander is available in the Event Store. The Outlander subclass Flash now unlocks Loot Llama at level 1 and ‘Phase Shift’ at level 2. Fixed issue stopping Flash Eagle Eye and Flash A.C.'s abilities and traps from scaling with Tech. Fixed issue stopping Flash Eagle Eye and Flash A.C. from interacting with Fragments at level 1. The Speed Boost Pad no longer grants Utility for every activation. Added sound for adding item to storage locker. Added sounds for clicking items in the Collection Book.